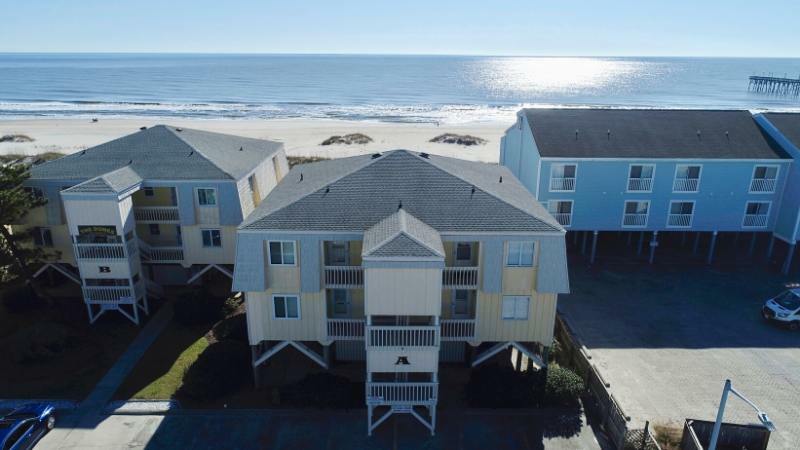 2 Bedrooms, 2 Baths - Oceanfront condo located in The Dunes. Dishwasher, Washer/Dryer, Microwave, 3 cable televisions, DVD player, HBO, wireless internet access, washer/dryer, dishwasher. This oceanfront condo complex is centrally located close to restaurants, shops, the pier and mini-golf. Located in a boutique complex with only twelve total units, this condo features a fully equipped kitchen, and a private oceanfront deck. The Dunes even features its own oceanfront swimming pool, shared charcoal grill. Max Occupancy: 8. All bed and bath linens provided with your stay. King/Double, Double/Double.